Nate Hall wraps up a Boilermaker. The junior linebacker played a part in Northwestern’s stout run defense in Saturday’s win over Purdue. Purdue was gaining momentum. 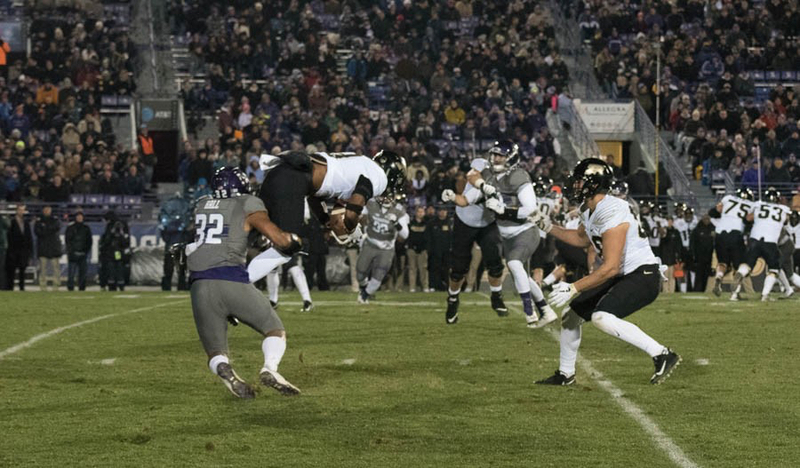 After finding the end zone for the first time, the Boilermakers forced Northwestern off the field quickly, and began moving the ball once more. Then Purdue hit a wall. Three times in a row, the Boilermakers ran the ball needing little more than a yard for a first down. And three times they were stopped, a turning point in the game and a symbol of the Wildcats’ staunch run defense, which helped propel No. 25 NU (7-3, 5-2 Big Ten) to a 23-13 victory over the Boilermakers (4-6, 2-5) on a cold Saturday night at Ryan Field. The Cats had an answer for every Purdue running look, holding their visitors to just 40 yards on the ground and an average of 1.8 yards per carry. D.J. Knox was the Boilermakers’ leading rusher with 22 yards on six carries — a far cry from the six-plus yards per carry he averaged in Purdue’s previous three games. It was the latest strong effort from NU’s run defense, which has allowed only one opponent to reach 100 yards in the last six games. Still, Saturday’s effort was easily the best of the year; no opponent had rushed for fewer than 80 yards all season. The Cats’ front was also solid in pivotal situations. With halftime approaching and NU up a touchdown, Purdue needed only inches to get a first down inside the Cats’ 5-yard line. But NU met Richie Worship in the backfield, keeping him from the first-down marker and the Boilermakers off the scoreboard. Then in the fourth quarter, as Purdue looked to get within one score, Markell Jones found no space on second down. He had the same result on third down. Then on fourth down, Knox ran into senior safety Godwin Igwebuike and redshirt freshman linebacker Paddy Fisher, giving the ball back to the Cats. Despite 376 yards on 37-of-60 attempts from Boilermakers quarterback Elijah Sindelar, the game never developed into a shootout — a development attributable in part to NU’s superb front. Fitzgerald acknowledged that fans would’ve preferred a more high-scoring affair, but the hard-nosed, line-led performance was still to the coach’s delight.